Put me out of my misery please. Did she or didn’t she? I’m guessing that she had too much sense to waste her money. I’m loving following her journey. I wish I could. . . I don’t have any photos of her that were taken at Chattanooga/Fort Oglethorpe, but who knows–she may have had some taken. We’ve all seen the photos of young men, looking serious and proud in their uniforms. I would think women would also feel the desire to have themselves depicted that way. I also have a similar sense. I bet that the women were really proud of how they looked in their new uniforms. It’s too sad to think she wouldn’t have had some professional photos taken just because her parents were gone. I hope she did it for herself and perhaps some proud siblings…or future nieces and her blog followers? I’m glad you scrutinized the art. I’ve been enjoying the drawings, and it’s nice to know a little more about how they were probably made. I looked at the booklet, and as you guessed, the artist was not credited (though the printing company was). Something seems wrong here. It’s so sad that artists often don’t get the credit they deserve. There was so much more work for artists back then. Even old small-town newspapers often had advertisements for local businesses with beautiful graphics. Somehow “outsourcing” it and using clip art, etc. just doesn’t seem the same. I hope she got her photo taken. I think she would have been serious about her new “career”. So do I–though I don’t have it. She does seem like she took her new career very seriously. I wonder if the artist might have been “in-house.” We’ve become so used to free-lancers, it’s easy to forget that some companies had artistic staff, who would have been salaried. I’ve known of such arrangements. As employees, they might have agreed to terms that they would simply provide illustrations for a set salary, and their work for the company would become the company’s property. Good point! Later on that practice became known as “work for hire,” with the artist not owning copyrights. I have a vague memory that a history teacher once told me that the great depression didn’t really end until WWII began. I’ll hope though, that friends and siblings were proud and encouraging and would have wanted photos. It continues to impress me that she had the courage, the spirit, and the confidence at 45 to strike out and forge a new path! It would be hard for a woman to do that today even with all the strides women have made. 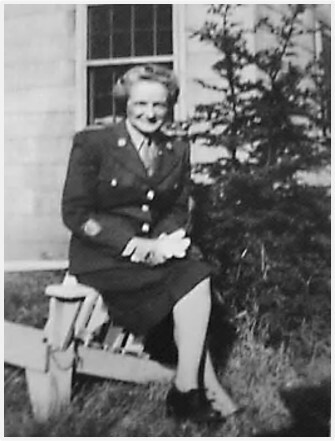 So far I haven’t been able to learn very much about what her personality was like before she joined the WACs. Even though she was living at home, it seems like she must have always had a sense of adventure. ‘Miller Brother Company department store’ has fast become one of my favorite old stores. I wish it was still in business. 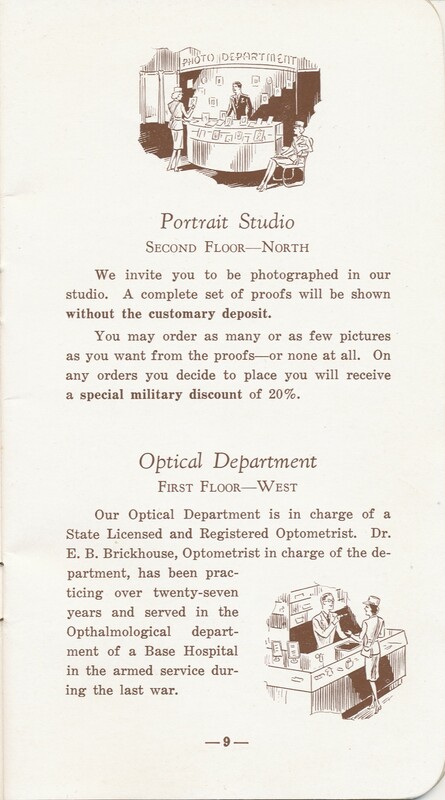 I figure the WACs appreciated the opportunity for photos to send home to their families and beaus. And, there was a lot more than what you’ve seen. I didn’t show you many of the pages in the booklet. tt really looks like it was an incredible store with numerous departments and services. I bet the studio was busy! And I think Aunt Marian might have visited as well…it’s always good, if not a must, to have a portrait in uniform! I bet it was busy, too. Even in the days before selfies, people enjoyed having photos taken.